Finland based handset manufacturer Nokia is reportedly planning to launch a 10-inch Windows 8 RT tablet – the device is slated to hit the markets at the Mobile World Congress in February next year. In an interview to DigiTimes on the news, the Taiwan based suppliers (a reliable source) said Nokia was discussing about parternering with software giant Microsoft besides a couple of other electronic companies – Compal Electronics and Qualcomm before resuming the design and development of the 10-inch Windows RT tablet which is reportedly expected to be unveiled at the Mobile World Congress located in Barcelona, Spain. It has to be noted that the event will take place between February 25th and 28th. This is not the first time that speculations about Nokia’s tablet launch have been doing the rounds. In fact, the news has been resting in air for close to a year now. Earlier during the year, in an interview to The Verge, Marko Ahtisaari, who is Nokia’s chief design head, stated that he’s had been spending almost one-third of his time coming up with various design ideas for the yet-to-be-launched tablet model. Local magazine DigiTimes came out with a report which said Nokia was initially looking to incorporate the Qualcomm’s S4 processor in the upcoming tablet. Also the Finnish manufacturer was planning to undertake the project with initial shipments of more than 200,000 units – all of which were to be tested in the first quarter of 2012. Nevertheless, Nokia cancelled its plan when software giant Microsoft announced its plans to launch its in-house ‘Surface’ tablet. And not surprisingly so, the Surface tablet made its debut to huge expectations from tablet lovers across the country, but was tagged with mixed responses from consumers and critics. 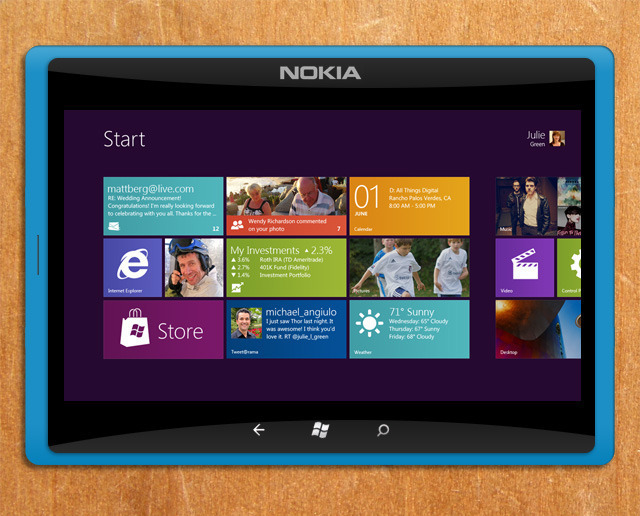 Microsoft is yet to reveal the sales figure of its flagship tablet – which is likely to happen sometime soon. Unaffected by the Surface tablet popularity, Nokia intends to have talks with Microsoft, reputed chip-maker Qualcomm, Compal Electronics, and ODM (Original Design Manufacturer) before narrowing down its options on resuming the development of its dream tablet venture. If launched, this will be Nokia’s first tablet in the market. So it’s actually no surprise that so much has been talked about of its upcoming tablet model. Nokia is in no hurry at the moment. The leading electronics manufacturer is taking one step at a time before starting with its full fledged tablet shipment procedures. Moreover, the company is reportedly working on the shipping volume before launching it’s tablet in the market. Nokia is closely monitoring the launch of Micrisoft’s Surface Pro which is the successor of the earlier version of its flagship device – the Surface tablet. One key change made by Microsoft in its upcoming Surface Pro version is the inclusion of Windows 8 Pro – designed for a better user experience. The device is undergoing full scale production as it is expected to be launched in a couple of weeks. It’s good news that Nokia is planning to set its footprints in the world of tablets which is dominated by the Apple and Android based models. Let’s wait and watch what Nokia can offer us! Travis Ramsy likes writing articles related to Technology News, Gadget Reviews and How To. He also does guest posting for buycharter – a site that offers savings and current information on charter cable, as well as charter.com services.